Dr Gerry Skinner may be the only vet in the world who only sees rabbits—a lot of rabbits. 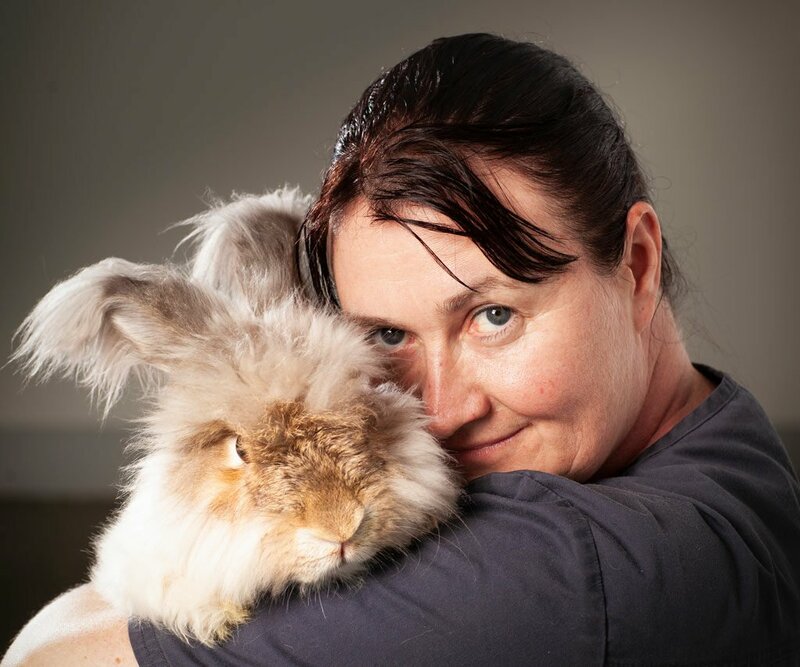 At her practice, The Rabbit Doctors, run out of the Centre for Animal Referral & Emergency in Collingwood, VIC, she treats over 2500 rabbits each year. A large part of the problem is that rabbits are seen as feral and vermin in Australia. When Australian farming is struggling, the ills of the industry are often blamed on that introduced pest, the rabbit. In Queensland, there is a fine of up to $44,000 for keeping a rabbit as a pet. While Dr Skinner doesn’t downplay the problems wild rabbits can cause, they are a very different animal to a domesticated pet rabbit. “An indoor, desexed, vaccinated rabbit is no threat whatsoever to the Australian landscape,” she says. One of the myths that Dr Skinner is trying to correct is that rabbits make great children’s pets. There is a belief that rabbits love to be picked up and held, they’re easy to look after, cheap to own, they can be kept in a hutch in the garden and you just feed them carrots. The path Dr Skinner took to become Australia’s rabbit doctor is a twisted one. Originally from the UK, her first degree was in archaeology and she spent many years working as an archaeologist and forensic anthropologist. She completed a doctorate on human skeletal remains and taught at the University of Bristol. One week later, Dr Skinner was on her honeymoon with her new husband. She chose that moment to tell him she wanted to change careers. She had owned rabbits since she was seven years old and thought that being a vet might suit her better. Dr Skinner applied for vet school at the University of Bristol, the same university where she was teaching archaeology. At the same time, she was appearing on television on shows like Time Team and despite her infamy in the archeological world, she was accepted to vet school. Dr Skinner graduated in 2003. Dr Skinner worked in a few mixed general practices in the UK where they soon realised she was mad about rabbits. At one practice she persuaded a few local breeders to get all 200 of their rabbits vaccinated. On top of this she was performing about five rabbit surgeries a week. Eventually she started an exotics qualification but her husband was offered a job as a paediatric cardiac anaesthetist at The Royal Children’s Hospital in Melbourne. On arrival in Melbourne, Dr Skinner discovered Australia has a really sound basis in emergency and critical care. She put the exotics qualifications on hold and instead gained ECC qualifications. Dr Skinner also used this time to do a lot of rabbit charity work with various organisations, including Rabbit Run-Away Orphanage from where she had adopted her first Australian rabbit, Elvis. She was also in contact with the Big Ears Animal Sanctuary in Launceston, Tasmania. Eventually she contacted a friend, Dr Guy Yates, who runs the Centre for Animal Referral and Emergency in Collingwood and proposed a rabbit clinic offering 24-hour critical care and emergency services. Five years later the clinic has six vets, six nurses and Dr Skinner is seeing 2500 rabbits a year. In 2012, a rabbit meat farm in Tasmania was put up for sale on Gumtree. Big Ears Animal Sanctuary, some other animal care organisations and a lot of individuals—including Dr Skinner—came together, donated money and bought the farm. Initially they were treated by local vets from Launceston as Dr Skinner was unable to get away from work. That was soon to change. Dr Gerry Skinner examines a rabbit’s ear with an otoscope. 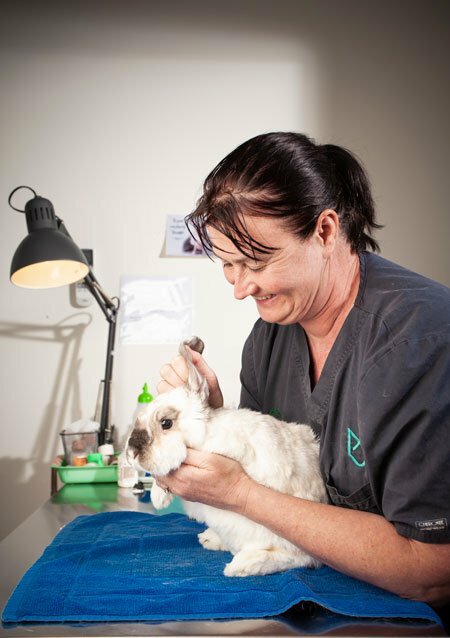 She says ear disease is one of the most common—and challenging—problems she treats in the many rabbits brought to her clinic, especially those with lop (droopy) ears. Six months later another group of volunteers flew over from the mainland and this time Dr Skinner was among them. She brought and administered vaccines for hundreds of rabbits and examined each animal individually. This has been happening every six months since then and the number of volunteers has grown to about 60 people, including vets and vet nurses. Big Ears Animal Sanctuary is entirely run on donations without any kind of government support. They are unique in that no-one earns a wage, everyone is a volunteer. Somehow, they manage to look after 500 animals on $120,000 per year. Obviously, there’s not a lot of money to throw around. “Gerry and all the other volunteers pay their own airfares, pay for their own accommodation, and supply their own medications and vaccines,” says Brett Steele. “All we do is provide a beautiful, fully vegan barbecue lunch for them. It’s become a bit of a highlight of our working year. It’s common knowledge that the veterinary profession has a terrible record in regard to mental health. A lot of people are struggling and the suicide rate among professionals is way too high. Dr Skinner also works with a company called Platinum CPD which offers continuing veterinary education courses. Two years ago, it helped her set up the first rabbit expo in Melbourne. There were three streams available—a vet stream, a nurse stream and an owner stream. The next rabbit expo is scheduled for November this year in Melbourne.